This is the last in a series of three blogs looking at how Policy Lab methods can help address some of the common biases of policy-makers. It is based on the Behavioural Insight Team’s (BIT) latest report, Behavioural Government, which identifies eight biases in three areas: noticing, deliberating, and executing. Sanjan's mapping with only 'executing' highlighted. See the full diagram by clicking to the first blog. My first blog was on noticing… if you missed it, it’s called Bias Busters: who you gonna call?. It explains what behavioural biases are and explores how Lab processes help policy-makers overcome framing effects, the (mis)allocation of attention, and confirmation bias. The second blog was about reducing bias when deliberating. In this final blog, I share how policy-makers can, and already are, using experimental approaches and practical tools to ‘bust biases’ when executing policy. Translating policies into reality, such as creating a new governance body, or establishing the infrastructure for a new service, is fraught with complexity. In government, policy and implementation are traditionally separated into linear stages. By the time a policy team explains their rationale to their delivery colleagues, the idea has often been solidified, thereby removing the opportunity for implementation to challenge or inform the programme. In the Policy Lab approach, those delivery partners are present from the start, bringing their knowledge of the frontline, challenging policy-makers’ assumptions and helping develop more robust policy solutions. The main complaint from civil servants involved in the delivery is a lack of pragmatism and tendency to be over-optimistic about how things might work. The Behavioural Government report highlights a review of 258 public transport infrastructure projects conducted between 1910 and 1998. “On average, project costs were 28% higher than expected, and they were underestimated for almost 9 out of 10 projects.” Worryingly over the years the was no evidence that governments got any better at forecasting - that tendency to be optimistic was not dented. BIT argues that unrealistic expectations and overconfidence can be driven by a combination of policy ambition, confirmation bias among individuals, and group reinforcement. 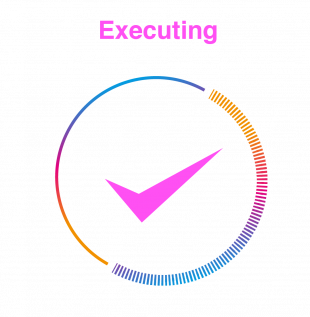 They recommend conducting ‘pre-mortems’ on policy proposals, making more than one estimate - and building in trials and variation into execution wherever possible. Policy Lab’s involvement generally starts at the earliest stage of policy, where challenge questions still need to be defined and strategies crystallised. For us, execution of a policy begins with the creation of the right challenge question and strategic direction. Here the same rules apply and, in fact, we think it’s even more valuable to explore multiple options at this early stage. Testing policy ideas is not new. Adaptive policy making was first proposed in the early 1900’s. Dewey argued that policies should be treated as experiments, with the aim of promoting continual learning and adaptation in response to experience over time. When working on more strategic pieces, we expand on the hopes and fears technique using speculative design. This imagines a number of possible futures and creates objects and artefacts which might be present in them as a way of provoking debate to elicit new insight. It’s much easier for policy teams to agree on a utopian vision - applying their optimism bias. So our speculations focus on either more dystopian visions or use ‘weak signal’ trends to form less conventional versions of what’s coming next. We’ve applied the approach to better understand challenges facing an ageing society and to test the government's approach to smart shipping. BIT recommends incorporating mechanisms for feedback and adaptation in implementation plans to break policymakers’ illusion of control. In effect this means finding ways to review how ideas are being implemented and if the delivery is not going to plan. BIT suggests there need to be “clear responsibilities for who should try and steer the relevant system”. The design approach works well here: prototyping helps you spot - early on - what might not work, and the focus on the citizen’s journey cuts through organisational silos to reveal the interconnection of systems. 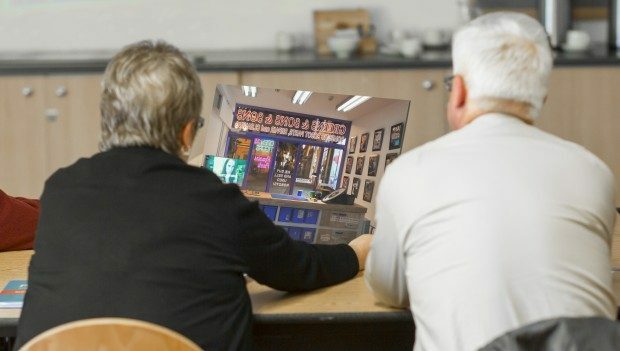 We’ve become increasingly interested in that system interconnectivity and how you can better understand and communicate it. The systems approach has the potential to create a paradigm shift in organisational psychology, and in government it challenges a policy maker's assumptions about how much control they realistically have. 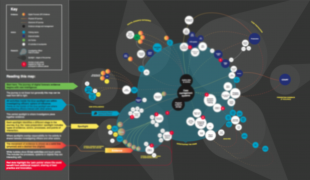 In a recent project, Lab mapped the way some types of information flow through a particularly complex system. This helped us understand the system in full and identify potential interventions. The map reveals how changes in the system can have an effect on other actors and helps identify where the major issues are clustered. The mapping helped stakeholders think through which agencies or departments could take on, or step back from, certain responsibilities. 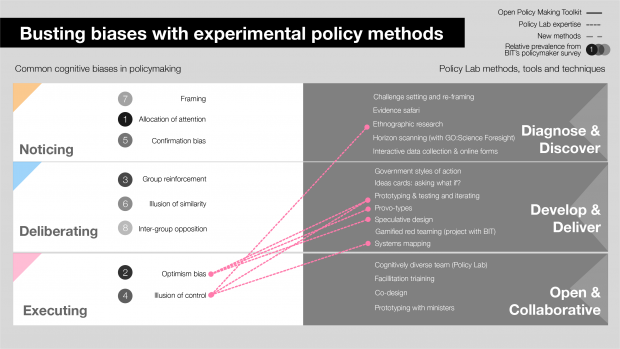 Over the last three blogs I have explored the connection between cognitive bias in policy making and Policy Lab’s experimental techniques. Bias busting is not an end in itself, but one way of ensuring better policy outcomes. We use all the methods I’ve discussed across large and small scale projects to support policy makers to tackle some of the most complex policy challenges in the UK. I hope this series might have inspired you to think about how experimental approaches might help you in tackling your policy challenges. We all have biases: it is in recognising and creating the space to challenge that we can all be part of making policy better. We’d love to hear what you’re doing to bust your own biases.